Being on the water and messing about in boats is part of what makes me tick and I've been in the boating business since I was 20 years old. My husband (although he was just a boyfriend when all this started) and I have worked together on boats and owned boats for as long as we've been together - and that's a scary long time! 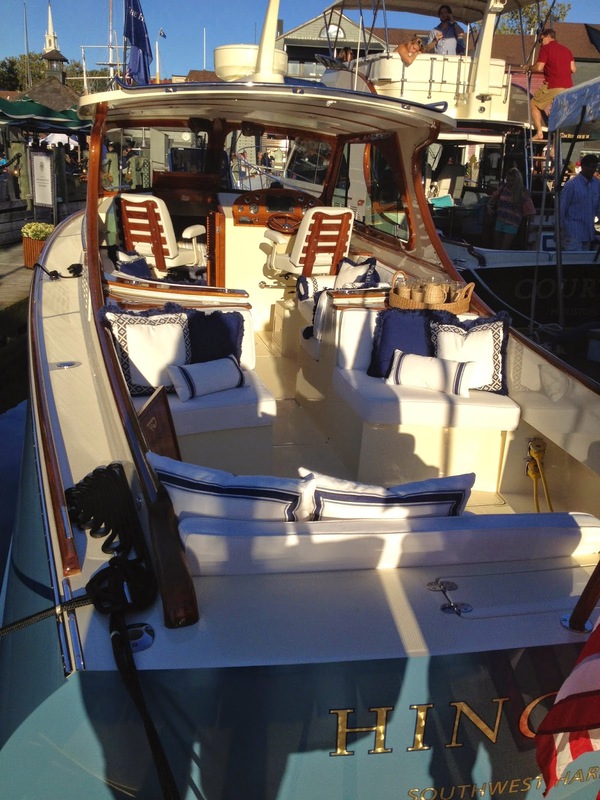 This week The Newport International Boat Show begins and runs from September 11th to the 14th www.newportboatshow.com, and I can't wait to make my annual trek to Rhode Island to see what yacht I can only dream of owning. SO, to prep myself for the beauty to behold, I am sharing some yacht eye-candy for you all. 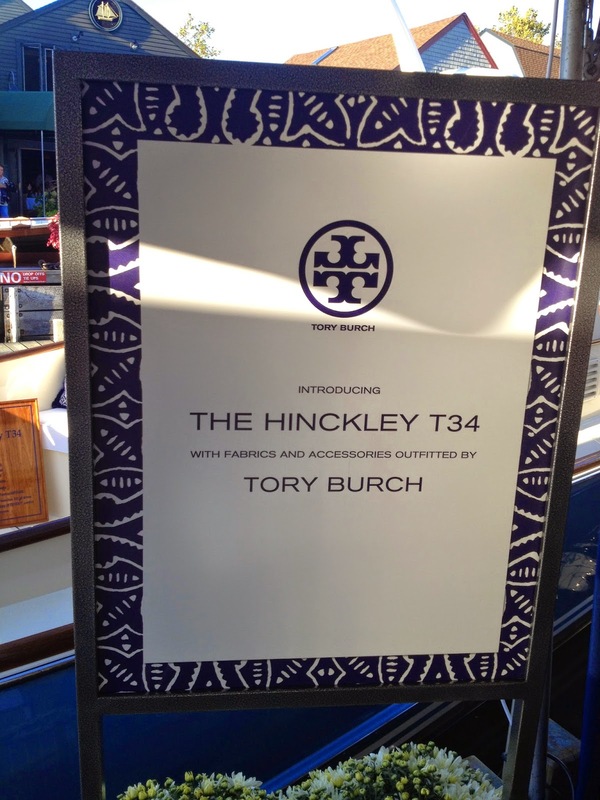 Enjoy this GORGEOUS Hinckley yacht decorated in Tory Burch trims www.toryburch.com and yummy color combos. All I can say is, Yes Please! I'll take it - at least in my dreams. With champagne in hand, I strolled along the docks stuffed with yachts of every shape and size. But when I came upon this Hinckley T34 jet boat www.hinckleyyachts.com , I was like Dorothy seeing Oz for the first time. Even though the light was wonky since it was getting later in the day, you can still see how easy it would be to climb aboard, have fabulous cocktails and nibbles and head out for a harbor cruise. Don't you love that Tory Burch trim on the pillows? I can only imagine the drinks flowing now, including my newest creation, The Nanny - which is simply Goslings Dark Rum and Pink Lemonade, garnished of course, with a flower and a cherry. The pillows are made using the fabric from Perennials, which is like Sunbrella, but the offerings are more for the design world with so many options to design just what you love. Up forward (that means, in the bow of the boat, under the deck) there is this delicious (as Martyn Lawrence Bullard would say) v-berth, or bed in the shape of a "V". 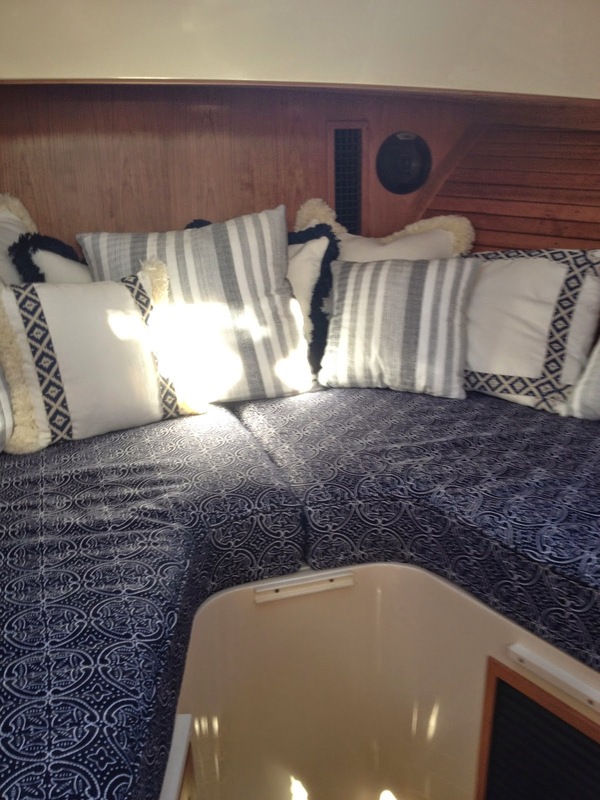 Don't you love the logo fabric and even more pillows using the signature trim? The perfect place to lay my head after too much sun and a few too many cocktails! I admit it, I'm hooked and would die for this boat. And come this weekend, I'll find some more yachts and other goodies to fantasize about! And don't forget to watch my latest tv obsession, Bravo's Below Deck which airs on Tuesdays www.bravotv.com. A lot of what you see actually happens - and if you can deal with some of those types of charter guests, you can pretty much deal with anyone!